In another topic, DaveD suggested I contact the USGS with some questions I had. I did so and here are my questions and the answers from the USGS. I wrote an email, got a response, wrote followup questions and got the answer to those; both series are here, separated by === lines. The most important part is the answer to question 5, and the additional information pertaining to it at the end of this post. I am embedding my replies in bold, red type within your email below. (http://www.ngs.noaa.gov/ngs-cgi-bin/recvy_entry_www.prl). (Since 2002, as a group, we have submitted over 25,000 mark recovery reports to the NGS.) Also, there is a website associated with the Geocaching website called the US Benchmarks category (http://www.Waymarking.com/cat/details.aspx?f=1&guid=424f2581-a02d-4914-9bc8-8f4cafe02680) for logging survey disks that are not included in the NGS database. Some of these are USGS disks, of course. Associated with the Geocaching site is a discussion forum on benchmark hunting (http://forums.Groundspeak.com/GC/index.php?showforum=10). I should make it clear that, although a few of our group are professional surveyors, in general we are simply hobbyists that enjoy finding survey marks and reporting our finds on the Geocaching and NGS websites, usually with photographs. 1. How many survey disks (bench mark, triangulation, etc. but not counting reference marks and azimuth marks) were set by the USGS? There is no precise record on the number of USGS survey monuments set by our agency since its inception in 1879. Rough numbers would be in the tens of thousands. The vast majority of the marks were set in support of the various scales of topographic mapping of the nation over the years. Additionally, some marks were set by Mapping or other USGS Divisions in support of earthquake monitoring studies, crustal deformation studies, and water resources subsurface water and subsidence studies. The National Geospatial Technical Operation Center (NGTOC) offices in Denver, CO, and Rolla, MO, only have records on marks set by the former Topographic and National Mapping Divisions. Marks set by Geologic and Water Resources Divisions are maintained by those respective offices. 2. 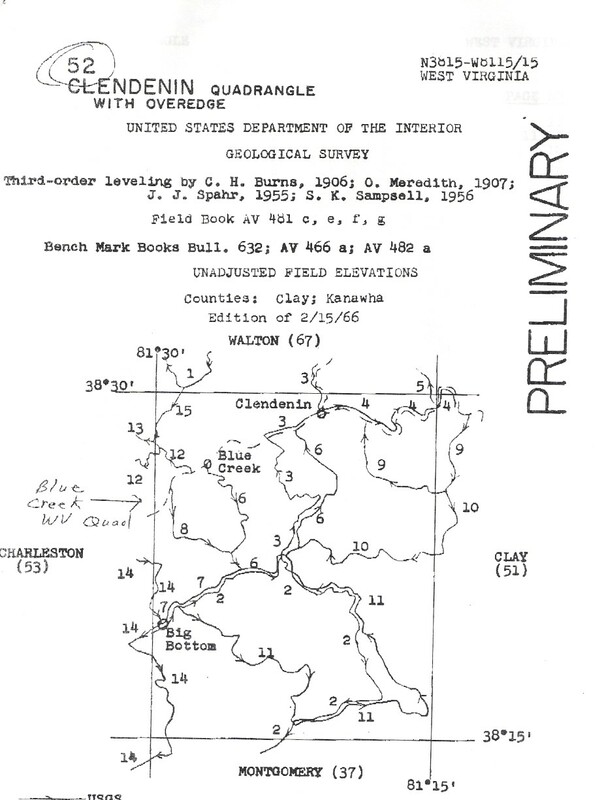 How many "BM" surveyed mark locations are indicated on U.S. topographic maps? Again, there is no absolute number of "BM" surveyed marks shown on our topographic maps. Marks shown with the label "BM" are those that have accurate elevations, but not necessarily surveyed horizontal positions. They were positioned on the maps through photoidentification on aerial photos during the field mapping phase, or, for maps older than roughly the mid-1960's, plotted on fieldboards with a planetable and alidade. USGS quadrangles show USGS marks, National Geodetic Survey (NGS) (formerly U.S. Coast and Geodetic Survey--USC&GS) marks, and some other official agency marks that were surveyed to third-order or better standards and approved by the USGS at the time of the mapping. Editorial policies during mapping operations specified showing benchmarks at no closer than one-half mile spacing. In most cases this was not a problem because monumented benchmarks and supplemental benchmarks (recoverable marks that were not tablets/disks) were set at approximately one mile spacing (one kilometer spacing in more recent years). The only time that the spacing requirement would come into play would be when both a USGS and NGS mark might be located in close proximity, or when marks were set close together in support of scientific studies. Then editorial thinning would take place. Horizontal stations are also shown on the topographic maps and indicated by triangles. These marks will have accurate horizontal positions, but most likely will not have accurately surveyed elevations. 3. How many of the USGS survey disks are included in the NGS database? Again, there is no definitive number. Many USGS horizontal stations are found in the NGS database, because either the NGS also occupied the marks, or the USGS surveyed observation records (angles and distances) were submitted to the NGS at the time the NAD83 national readjustment was undertaken in the early-to-mid 1980's. Very few USGS benchmarks are in the NGS database. Only those that NGS occupied, or those surveyed to second-order-or-better standards and submitted to NGS were placed in the database. There had been a plan for USGS to submit all their benchmark data to NGS for inclusion in the NAVD88 adjustment, but this never materialized because of resource limitations in both agencies. It is truly unfortunate that this did not occur. 4. Is there a way to request location information from USGS offices? Yes, for Montana, Wyoming, Colorado, New Mexico, Texas, and all states west of these you can contact the Geodetic Control number in Denver at 303-202-4400. For all remaining states contact the Earth Science Information Center in Rolla, MO, at 573-308-3500. If email would be the preferred method of correspondence, then it should be sent to ask@usgs.gov This address is not specific to any one office, and the requests may take longer to answer because they will have to be redirected to the correct location. USGS data is, as you stated, in paper format stored in file cabinets by 15-minute blocks corresponding to the old 15-minute map series. Ideally if requests can be made by USGS quad name or lat-lon positions it will be easy to track down the requested information. If the mark has been found, then the stamping on the mark will expedite the research even further. If only the elevation adjacent to the BM label on a Quad is available (along with the quad name), that is OK too. The desired information can be faxed or mailed back to the requestor. We can also provide the information by phone if a contact number is provided with the request. If BM information for a few quads is desired, we can handle that without difficulty. There is no charge for providing this information on a small scale. We don't encourage requests for large blocks of data, as filling these requests is a subordinate function for the few people handling the control information. There used to be a charge for providing the information, but it was so minimal that the time and effort to handle the charges were not worth the effort. I seem to recall someone saying in the forum that sending some particular amount of money to USGS office(s) would get copies of location information for all the USGS marks on a particular topographic quad. We have heard that the USGS survey mark location information is in paper form; not computerized. Oddly tnough, people usually ask in the forum for information about a particular USGS disk after they have already found that disk and noticed that it is not included in the NGS database. Perhaps they just want to know more about how its location was givenin paperwork. Is there some standard source(s) of copies of survey mark location information and its price? See above. 5. What is the USGS interest in receiving (via email, letter, etc.) 'find reports' (like the NGS recovery reports) on USGS disks? Yes, we would like to receive information on the condition of any USGS marks you find, as well as lat-lon coordinates and digital photo(s). I have received these in the past and placed them in the control folders. A few have been sent from geocachers, although most have been obtained from surveyors who wanted to provide an update on the status of marks they have used. The USGS descriptions are always old, and mostly out-of-date. In nearly all cases, the only recovery notes on record were submitted by USGS personnel during topographic field mapping operations, which hasn't occurred in decades. The method by which the recovery information can be forwarded to the USGS can be left open to the individual geocacher. We have received some information in emails, along with attached photos; letter with printed copies of the photos; or CDs mailed with spreadsheets and photos for marks on multiple quads. I suggest that any recovery information should be sent to the individual from whom the descriptive data was obtained. that way they can update our records. Again, it is unfortunate that the USGS does not have an on-line mechanism to report mark recoveries similar to NGS, but we do not. Thank you very much for your response to my email! I am certain that our folks will find your answers extremely interesting and even a bit surprising (the part about the USGS being interested in receiving mark condition reports). I do have a couple of followup questions. a. Only those USGS marks that are not included in the NGS online database. 1b. We would like to know about all USGS marks. We prefer to receive recovery reports via email rather than phone. Thank you for your inquiries and interest in updating the status of USGS control stations! Thanks for taking the time to correspond and get this information! I had read someplace (probably here) that the USGS really wasn't interested in the condition of their marks any more, so this is interesting (and good) news. I appreciate the information on recovery reports. I'll have to go through my photos and recoveries & forward information to them on the USGS marks I've found. I'd be interested in reporting to them. Now I can finish up on some of that work. I see that he said all 3rd Order or better marks. I have a bunch of those from the Quad map recovery I did with the Field notes from Rolla USGS. Do they want updates on "ALL" these? I may try getting a 3rd Order Waymark group if it can't be placed in the Benchmarks. We are working on the PLSS one now. Got to get those chisled squares,nails,spikes,copper washers and rods and the likes in there too. Hey, that's really interesting! I'll probably report some of the ones I have found also. I might have to go back to get some better data, since my attitude was often: "Ah, it's only a USGS mark, they don't care about them". Turns out they DO care! Next: US Army Corps of Engineers. They have LOTS of survey markers of various sorts as well. National Geodetic Survey maintains the master control network (National Spatial Reference System) at the ultimate precision. They have their data base on line and Geocaching uses an old snapshot of their data and you can log the items in that snapshot. US Geological Survey is the agency that makes topo maps and other data for users. They have set a lot of marks, a few of which show up in the NGS data base and consequently the Geocaching data base. Marks of any agency that you find but don't show up on geocaching (there are thousands of fed, state, local, and commercial operations that set marks) can be entered as Waymarks on that side of the geocaching site. Some people like to just find the ones they can log on the Geocaching site. Some people like to find just ones that can be logged at NGS. Some people like to find everything on a topo map. Some people like to find everything they can enter on Waymarking. Take your choice. Here's my take on what has happened. The National Geodetic Survey (NGS) is part of National Oceanic and Atmospheric Administration (NOAA), which is part of the Department of Commerce. The United States Geological Survey (USGS) is part of the U.S. Department of the Interior. So, although they are both U.S. Govt. entities, they have no direct relationship to each other. As for survey marks, the NGS has a database that Groundspeak copied in 1999 or 2000 and that's what we use. In that database are disks and other marks from many different Federal, State and local governments as you have probably seen in BuckBrooke's list. Some of the 700,000 marks in the NGS database are USGS marks. Getting a mark into the NGS database requires bluebooking (I've heard it's expensive). The USGS didn't bluebook all of their marks. (See Dale Benson's answer to question 4 at the beginning of this topic.) Instead, surveyors having a project to do in the area would decide to use a USGS mark because they knew it were near their job area and didn't want to do all the digging and cement mixing to set a new mark. A matter of convenience. Then, since those surveyors were working on a project that involved the money to do the bluebooking, they bluebooked the USGS mark along with some marks that they did set in cement along their project. Thanks, BDT!! I had contacted them about one mark, and got info back, but this was a long time ago. Glad to see they still offer the service. Wonder if they'd be interested in hiring some PTers to digitize the whole thing? Thanks for the responses to my ? So what should my next step be? Should I make a phone call and request a few documents be sent my way for me to try? I wonder what these sheets will look like. Will they have "location Adjusted" etc do you think? If you go to Zhanna's website here, you can see what these datasheets look like. If anyone has advice on whether I should try - I'd appreciate it. The copies of the datasheets that I got from the MCMC (USGS office) in Rolla for the ones around Rolla two years ago had only TO-FIND descriptions and no coordinates also. Yep, in fact, the California ones on her site were ones that I sent her. I think it's fun looking for these, but I understand that some people may be reluctant to try based on such skimpy information. Note that although NGS PIDs aren't mentioned in the USGS reports, many of these marks are indeed in the NGS database, thus offering a further source of information for finding them. One thing to keep in mind is that except for those instances where marks are too close together, most of these USGS marks are depicted on the USGS topos, even ones that are not marked by a disk. (chiseled squares, spikes in poles, etc.) In my experience, the accuracy of the plotting of these marks on the topos is pretty good. Most mapping software products will allow the user to derive coordinates from the map image. For the horizontal stations, you need to remember that the datum is most likely NAD27. I got about 15 quads of info to forward. what do I ask for? what terms should I use that they will understand? (the last thing I want is for them to say "oh great - this guy has no clue what he wants - he must be one of those geocacher types.") I simply want some in my local area to start with. I recommend asking for the BM's in a particular quad. Look at a quad and see how many "BM" you see. Just phone or email them with the quad's name and ask for copies of the papers that show how to find those marks. Dale said that they organize by the old 15-minute map series (four 7.5-minute quads in an old 15-minute quad). Maybe someone here knows of a website that shows the 15-minute quad names. having never really dealt with maps / topo etc. how do I know what quads to ask for? If you go to any hiking supply store they will have charts showing all the quads in the area. You can then pick and choose which quads you would like to use. There are also a number of software programs that will show you the USGS 7.5 minute Quads. Delorme 3D TopoQuads is one, and another is National Geographic "Topo!". If you go that way, be sure you get the one that has the USGS 7.5 minute Quads. E.G. : NOT the Delorme Topo USA. It will be in the area of $90 to $100 for a whole state. OR - you can look at Topozone, maybe subscribe or stick with what they give you free. So what is this telling me and how do I know what "quad" its in? Above the map it says USGS Blue Creek. It is showing you an area that is in the Blue Creek Quad. Probably at the center of the map. If you used the arrows to relocate the map eventually the center of the map will be over another quad that says USGS Quad Name. Sometimes other information will show up in this line as well but the name after the USGS is always the quad name in my experience...limited as it is. This USGS store site will help some. It has to be at the "500 level" to show the names of the quads. In the link you just posted, the quad name is "Blue Creek". You can see that name on the top of the topozone window. This is correct. Topozone will display the quad name for the center of the map (the little red cross). In addition, if you click on the link on the left ("Map and Photo Info") just underneath the box saying "Download every USGS Topo Map & Aerial Photograph available here $9.9" that will bring you to a page giving the quads for all 3 series (1:24,000, 1:100,000 & 1:25,000) including publication dates, and feet vs. meters. The other thing to be aware of with Topozone, is that you can set the datum (NAD27, WGS84, etc.) and the coordinate system (UTM, ddd, mm, ss etc.) for the location given at the top (2 lines below the quad name) which are for the little red cross. This is a good way to get coordiates for a point you click on (like a triangulation station). For those in the Northeast HERE IS a listing of 15 minutes maps with a quad index available. Well - last Friday I took the leap and called for some info on the quad I had mentioned above. The fellow was VERY nice, and patient and helpful - and although he hadn't fielded any calls like mine - he did know it might happen (he had been forwarded this thread I believe). He also thought it was cool we were doing this. As described, he had to go to a file cabinet (I actually heard it open!) and in this quad alone was a vast # of pages. He sent me 9 ( I didn't want to ask for too much). Here is where you all come in. I need help figuring out where these descriptions are. I am happy to search - but I at least need a ballpark area. Please help - and please.... simple explanations are best as this is all greek to me. Thanks y'all. I'm not sure I know what you're asking, but reading your note, "I need help figuring out where these descriptions are", and not knowing WHERE in the country you are.. that kinda makes it hard. If that's all you have (no township, road name, county, etc.) then that will be a very, very long search. Heck, it it was only 13 feet west of the centerline, that tree's probably looong gone, even. I don't know what road either - there are many - and its like that on all the pages almost! "From Blue Creek along roads generally southeast northeast and northwest to point 2.0 miles southwest of Clendenin(by S.K. Sampsell, 1956; Book AV 481 e). I see several here that kinda fit that description. Up and down the main road. Most of what I seen at the SW was Oil wells,maybe USGS has something around them. 2) So if I can't read a topo map I can't search these out? I was hoping all the numbers and letters meant stuff that I could learn to interpret. Does anyone really know what all the text means - or is it like code only those who wrote it know? UGH! Maybe I should never have requested the stuff to begin with - but I really do enjoy hunting Benchmarks and thought this would be a good idea. maybe I was wrong. I have numerous map programs but the one that I use the most is Terrain Navigator Pro from Maptech I also use Terrain navigator. All of N.E. for the pro is $299.00 and the Navigator is $99.00 for N.E. The detail and ease of use is worth the cost. With the pro the NGS bm's are on the map which makes it easy to find them on any quad. These USGS marks are organized in lines that are run along the path of least resistance - usually roads. The first page of the datasheets for a particular quad usually consists of a sketch of that quad with the lines drawn in. Use the lat-long of the corners of the quad to approximate the location of the line you are interested in. Looking at the approximate location for the line on Topozone, you should notice a road that runs in the same orientation as the line sketch. Careful examination of the length of the road should reveal little X's with BM written next to them along with a number. These are benchmarks marked by disks. The number is the elevation to the nearest foot. Occasionally, you might notice little X's with just a number - no BM. These are intermediate points along the line that were marked, but not with a disk. You can try to match up the elevation on the topo with the elevation on the datasheet to determine which one it is. They can be the copper nail and washer of your example, or a chiseled square (often on concrete culvert headwalls), or a spike in a utility pole, etc. The datasheet will tell you what to look for. You need to examine the datasheet in its entirety to understand the numbers. The 5 and 11 may indicate the line and mark number. (The line number is also given at the beginning of the list for that line) The 6.11 is most likely the mileage along the line. On a "What a coincidence!" note, S.K. Sampson was also the party chief for a lot of leveling done in my area, Woodstock VT, in that same year, 1956. I guess they kept him pretty busy! If you can post an image of the sketch page that shows the lines, and tell us which line your example is on, I'll bet we can find it on the topo. Tom very useful information, thank you! I suggest this thread be made a stick note! OK. I have the 2 necessary pages scanned. Could someone post em for me? I bet seeing them will help. How do you post pictures here again? and i'll do that - as I really want to know how to go searching for these with no street names etc. grex3wv - I would have to read the entire datasheet to make sure I'm giving you all the correct info, however, UE means "Useful Elevation." As you will note it's not a permanent bench mark but rather a nail in a tree which was mean to be temporary. First: Upload them to a Host,that could be a old geocache page,a place like flickr,google,picasa or any other host service. Second once the image is uploaded you need to view its location and or properties and find the link in the address bar. Third copy and paste that url into the box you get after clicking the box uptop in here that looks like a tree. I hope that helps,I am ot good at giving great directions for that stuff. If you can't do it send me a PM and I will send you an addy you can send the images to. Since USGS has never automated their survey control information, their data is still in paper format and published as separate 15' quads of horizontal and vertical survey data. That's why many of the publications will have no coordinate information - they're vertical only. NGS used to publish data in a similar separate format (30' x 30') until we created our digitial integrated database in the late '70s. As with NGS data there are many USGS marks that will have one component (horizontal or vertical) well determined but not the other. If you want all the USGS data for an area make sure you specify that you want both the horizontal and vertical control data. The descriptions/ties for the quads for my area that I've received in the past are often extremely terse, as noted above, especially for older marks. Echo to most everyone else's comments. How do you post pictures here again? You can use this process or do this, or use a temporary photo storing site like this. Although the latter is temporary, it will serve to get this discussion to proceed and by the time the situation is solved, it won't matter much anymore if it eventually disappears. OK maybe I got you lined out a little for a while. I forgot to note in the KMZ that if you check those points I sent you you will see the BM and the roads line up with the Quad overlay. Her is the Google Quad Overlay. Here is the Front Page of the Data sheets. Looking at this copy posted by GeoTrailblazer, it looks like we'll need some sort of guidance on how to read this stuff. I weary of making guesses. The numbers on the right margin are obviously elevations, but I don't know what any of the 3 numbers on the left margin are, except that at least one of them might be a survey string's number as shown on the sketch map. The only mark in this list that I could say that I know about where to park my car and start looking is the second from the last one that starts "Coco". As to the others, I have no idea where on this quad they are. Unless someone here has got this all figured out, I will make a new list of questions, write Dale Benson again and show the answers here. I imagine that the USGS would appreciate reports on all the marks, but personally, I think I'd rather save on some gas money and just go for the tablets. I suspect the nails and spikes have all gone. BDT, if you look at the map you see the lines with the numbers and arrows. Note the direction of the arrows and follow the number back to the starting point as indicated by the "O". If you then look at the chart below the map the second column of numbers is the line number and the description next to the line number give the description for the benchmark at the "O" position. The rest of the line numbers indicate the elevation isobar and how it is positioned on the map. OK, cool. Let me see if I have this correct. 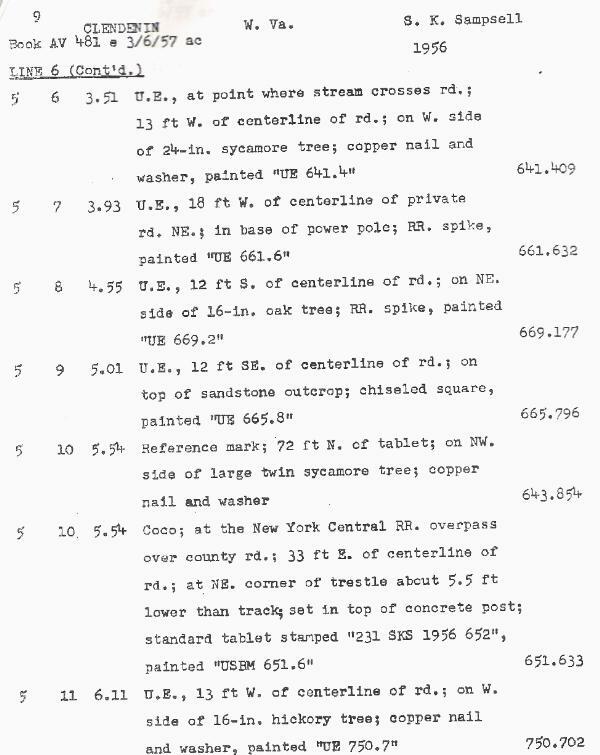 On the list of marks, the second column is the number of the survey line. The "O" mark called Big Bottom could be the start of survey lines 2, 11, or maybe 7. I still don't know which description entry is for station Blue Creek and which one is for station Big Bottom. Where on the sketch map is Coco? Is it where survey line 10 starts (at the intersection with 9)? What is the number in the first column on the left (the one that's always a 5)? What is in the third column of numbers; the one that has 3.51 in the first item? What do "U.E. ", and "Coco" mean? I haven't used these sheets, so I'm only guessing, but it would seem that the second column is a sequential numbering of points for which elevations were recorded along the line. Maybe the 3rd number is the distance from the starting point of the line in miles or kilometers, along the route they used for leveling. Note that these numbers increase in the list and that the RM and disk have the same value in this column. U.E. was stated by DaveD above to mean Useful Elevation. 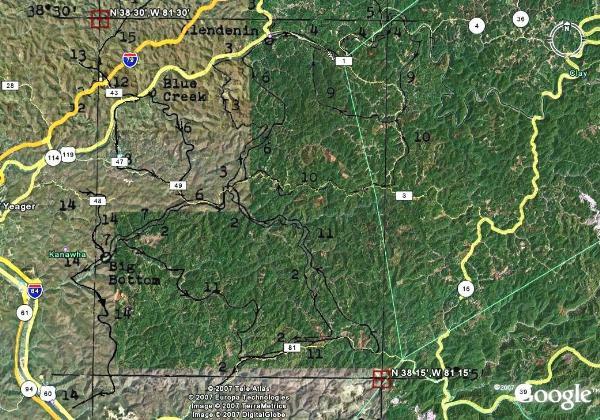 Point number 10 is at Coco, a populated place in Kanawha county, located about 38° 24' 10.80", -81° 25' 8.40"
The current USGS topo map (Blue Creek quad) has the RR listed as Conrail, which was a successor to the Penn Central, which resulted from a merger of the Pennsylvania and New York Central RRs. Note that the sketch indicates a 15x15' quad, not the more familiar 7.5' squares we usually see today. Maptech has a high-quality scan of the 1906 topo map for this quad. First off - thanks to Geo for posting my pics of the sheet I requested and received via fax. Greatly appreciate it. I wil read over and look at the hard copies to try and make heads or tails of everything folks have written. As of right now - I am still confused. Artman - you wrote: "Point number 10 is at Coco" - problem is - I see multiple "10" references on the map - I live in this general area - so if I can get a fix on one I will go find it (if I can) then report back. If you can translate "38° 24' 10.80", -81° 25' 8.40" into units I am used to using here at GC.com with my GPS - i'll head out that way and try and figure the spot out using the description. shew - there sure is alot to learn - especially when you are just getting the hang of find the NGS ones. The description for Coco is where the RR passes over the county road. If you look at the map, there is no RR showing so you will need to compare 2 maps (overlay, if you prefer) the map showing line 10 with the map showing the roads and RR. Where the 2 intersect is where you will find the benchmark. Line 10 is the contour line for that elevation (plus or minus a small amount) and where that line matches the description for the county road and the RR overpass is where to start your search. I also thought that the third column as being the milege along the survey line. I was imagining myself using one of those map measuring rollers along those wiggly lines, trying to find where the benchmark tablet was. But I don't really know, and am weary of guessing.